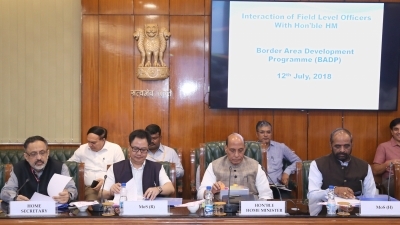 New Delhi July 12 (IANS) Union Home Minister Rajnath Singh on Thursday emphasised the need to improve social and economic infrastructure for people residing along the international borders so that they continue to live in their villages and assured that Centre would "continue to provide assistance to states" to strengthen activities under Border Area Development Programme (BADP). The Union Home Minister s remarks came while chairing a meeting to review the ongoing development programme being run in 17 states -- Arunachal Pradesh Assam Bihar Gujarat Himachal Pradesh Jammu and Kashmir Manipur Meghalaya Mizoram Nagaland Punjab Rajasthan Sikkim Tripura Uttar Pradesh Uttarakhand and West Bengal -- which have international borders. Stressing that the border population is "strategic asset to the country and important element to maintain border security" he called for all efforts "to improve social and economic infrastructure to ensure that these people continue to live in border villages." "The government accords utmost priority to social and economic well-being of border population and to provide them all facilities like connectivity safe drinking water schools hospitals and other facilities to ensure sustainable living in these areas " he said. Rajnath Singh also assured Centre s "continued assistance to states to strengthen infrastructure and development activities under the BADP besides discussing relevant issues regarding implementation of the programme and to make it more effective" a Home Ministry statement said. "Additional funds will be made available as per requirement. Each model village will be provided all basic facilities like primary health centre primary education community centre connectivity drainage and drinking water to enable sustainable living in border areas " he said as per the statement. The outlay under this programme has been increased to Rs 1 100 crore in 2017-18 from Rs 990 crore in 2015-16. For comprehensive and all-round development of border villages it has been decided to develop 61 model villages for which Rs 126 crore has been released to the state governments the statement said. The Union Home Minister also interacted with field and state-level officers who are implementing the BADP. He also launched the BADP online management system for better planning monitoring and implementation of various projects under BADP. Border states can submit their respective annual action plans online and receive approvals from Home Ministry in electronic mode which will bring in transparency in the sanction process and improve quality of planning and implementation said the statement. BADP covers 111 border districts in 17 states to meet special development needs of border population with focus on people living within 50 km of the International Border. A total of Rs 13 400 crore has been released since the programme was initiated in 1986-87. Union Ministers of State for Home Hansraj Gangaram Ahir and Kiren Rijiju Union Home Secretary Rajiv Gauba Special Secretary Border Management B.R. Sharma and other senior Home Ministry officials were present in the meeting.